This week I paid £3.50 for a chocolate bar. 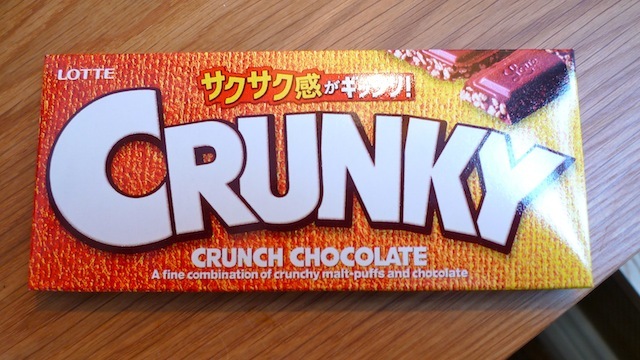 A chocolate bar called ‘Crunky’. I don’t know quite what madness came over me. I was in Marylebone’s newly-opened Monocle Café, a spin off from Monocle magazine, and somehow I’d taken leave of my senses. Whatever force it was that was driving me was overwhelming, and I didn’t understand it, but I knew I was happy. Any power of independent thinking that I may once have possessed had been overwhelmed by slick Japanese-Scandi design, a slick international clientele, and the giddy but probably desperate hope that I might just pass as someone slick enough to belong there myself. £3 for a macchiato, explained the dapper staff. No problem. Would you like to try Tyler Brûlé’s favourite Japanese chocolate bar for the aforementioned eye-watering price? God yes. How about a Parisian macaroon baked by a London-based Japanese bakery? Oh, please. My wallet still hasn’t forgiven me, but I don’t regret a bit of it. Monocle – the magazine edited by Mr Brûlé, that is – may be a fascinating read and a beautiful object, with its endearingly earnest mixture of business, current affairs and calmly aspirational lifestyle features. But above all, it’s an exercise in the canniest of branding. It’s this that has enabled it to break all the rules in the publishing book and come out on top. You just want to be part of their gang. 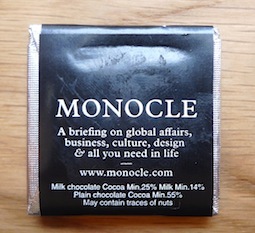 Monocle has always been much more than a magazine. To read it is to feel like a member of an international elite – jet-setting, entrepreneurial, and with impeccable taste, whether that’s really the case or not. If there’s one word that sums up Monocle, it’s ‘precious’. It’s also full of articles on just how various institutions – department stores, cafes, hotels – would be run in an ideal Monocle world, a world in which we would all rejoice in the life-changing benefits of great design, and where entrepreneurship would skip hand in hand through the streets with social democratic values. 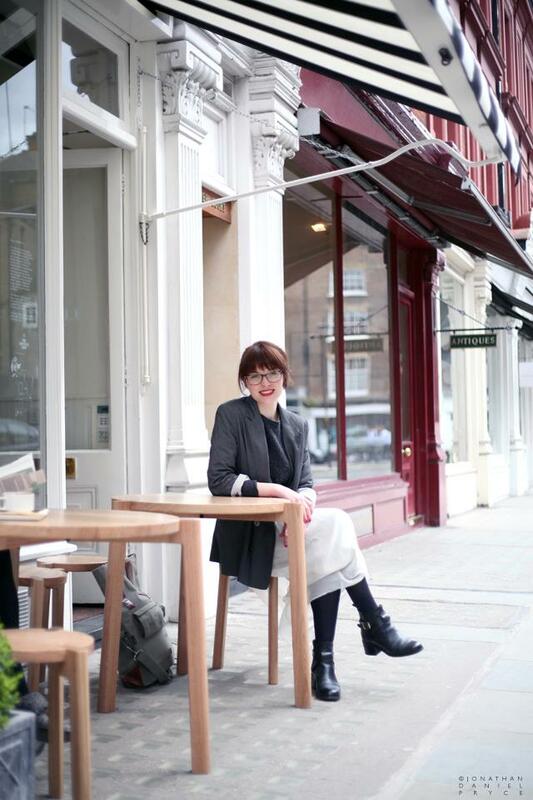 So, when the first Monocle Café outside of Tokyo opened in London this month, I had to go and see what life in Monocle-land would be like. The Monocle Café is a small space with an aesthetic that, exactly like the pastries, lies somewhere between Scandinavia and Japan. The glasses and carafes, the cups, the trays, the teaspoons – all are, naturally, impeccably selected. Monocle’s radio station plays all day long, and back issues of the magazines stand proud against the walls. You can sit outside under a striped awning, or tucked away in an adjoining back room with sofas and a 24-hour news channel on a TV. A customer asked if it might be possible to mute the sound on said TV while I was there. It was not possible, he was informed. Tyler Brûlé had decided that the TV would show what the TV was showing – with sound – and that the radio would play what the radio was playing. And so it would be. 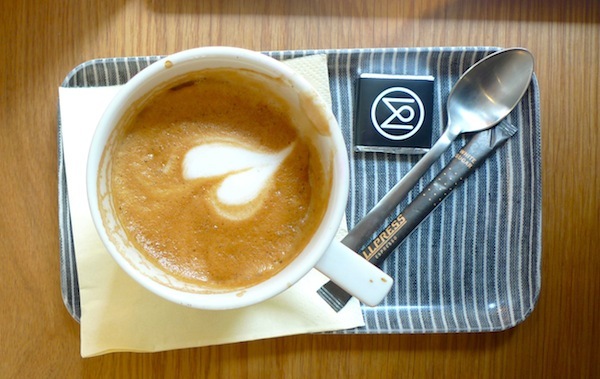 The Monocle Café is a totalitarian mini-state under the rule of an apparently benevolent and design-obsessed ruler. The brainwashing effects are remarkable – witness my profligate spending on what were nice, but by no means outstanding, things. The Allpress-supplied coffee is good but far from being the best-made in central London. You can get much finer coffee for less. The tea is bagged, not loose-leaf. The pastries are great, because they’re brought in from great suppliers (Fabrique Bakery and Lanka Pâtisserie). The way the space is designed doesn’t allow you to sit in the front window, which in my mind is the best thing you can possibly do in a café. But I’ll go back and spend more money there because it made me feel good, even though I know that’s daft. I’m a bit of a mug, I know. But an impeccably-designed Japanese Hasami porcelain mug. So that’s all right. Love this blog! Have a great heartful day! If you have to be a mug, why not a high-end elegant one? Too funny. Peace and comfort is worth it wherever you find it. I was just reflecting this morning, basking in the spring sunshine, outside Starbucks that sunshine + caffeine + sugar = zen contentment. In my case, I always get a non-fat chai latte, and consider myself happy. I walk there and back, and sometimes even manage to plot out stories. I feel no guilt, but perhaps I should. Maybe I will someday, just to try it out. Brand name bargains… what a thrill, eh? 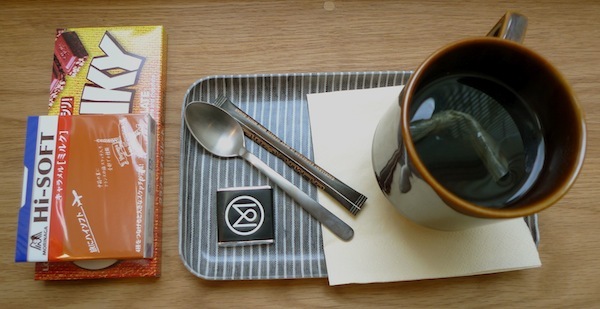 I’ve been looking at the picture of the teaspoon for a minute now, and I’m failing to see how it could qualify as “impeccably selected.” Though, I have to admit, it is at an an impressively accurate 45 degree angle relative to the coffee and tray in both pictures you supplied! Ha. It’s beautifully-weighted, though the matching forks are perhaps more distinctively beautiful. At some point in my life, many £3 coffees in, I admitted to myself once and for all that the reason I go to cafes is at most only half about the coffee. Spending time in a good cafe makes me feel like how I imagine one would feel on a regular basis going into their living room if they were the kind of person with time, money, and aesthetic flair to make said living room something other than a box with a couch in it. So I prefer to think of my £3 as just the rental price for the living room of my dreams. Which, especially if you include the free coffee, is quite a deal! That’s a fine way to think about it, though I still find it cheeky that they charge 50% more than the average swish coffee shop for basically a shot of espresso. I’m mostly with you, though. Sometimes coffee is worth every penny of whatever they are asking for it! “Crunky” is now my official code name for anything overpriced simply because it is “in.” For instance, the cotton socks I buy in the pack of 6 are uncrunky. The shoes that go around them lack crunk, too. I cook my own food, brew my own beverages, and make a lot of my own clothes, which is all fairly crunkless. As a matter of fact, my life is pretty much sans-crunk. But my peace of mind is unlimited, thank goodness. A friend told me once that in her late teens she was in a swank retail store asking the saleswoman there the price of an outfit she was admiring. The haughty saleswoman (you’d have thought she owned the shop) responded with something like ‘if you need to know how much, then you can’t afford it.’ My friend can afford it now but hasn’t been back. I’m imagining that you paid up for similar reasons. I don’t mind where I go when I’m on my own as long as the coffee is hot, they leave me alone once I’ve been served and the light is good enough to read by. Well done to you for being freshly pressed. Love the tray! 🙂 Otherwise, the idea of renting a lifestyle is spot on. ohhh, i love a good pretty cafes. can spend hours in there. i love the peace it offers at times, sometimes i just like to sit and observe. each cuppa has a new story to unfold but you should be patient enough to listen to it. and if you manage to, then the price paid seems immaterial. well done. well written post. congratulations! $20 for strawberries?! That’s crazy. What were they, gold-plated? I can totally understand the appeal. The magazine has had me thinking that £300 for a bag seems pretty reasonable. Not that I could ever hope to afford that bag… It’s a very canny exercise in beautifully designed branding and you’ve nailed the Monocle magic – you just want be part of their very cool gang. I’d love to see how they’ve applied that to a cafe, but I don’t think they’ll be opening in Brighton any time soon. The first issue of Monocle I read was a two-year old issue on the most livable cities. I read it end to end anyway. I’ve yet to pin down what exactly I love about it, and what it stands for. Thanks for summing it up! My next beverage idea: Crunky? Fun article, thanks for sharing. Any respite one can find, even inside of a coffee mug and a candy bar, is a good thing these days. I guess when you get closer into the centre of London prices go up for the companies overheads so they try to up prices for customers! The coffee looks pretty but its all about the taste! I love a macaroon however so i might have to pay it a visit – although Paul satisfies my needs for now! This was probably the most adorable thing I read all day (despite your £3 woes). And ironically enough, the music I was listening to as I read it was equally as hip, for a lack of better words, as the article. Violin Romance no. 2 anyone? Anywho, excellent read, congrats on the Freshley Pressed, and welcome a new follower (if this app would work)! I had run out of places to be ripped off in London but you have opened my eyes/taste buds. Arigatou. I identify myself with the chocolate rush! Was it good? I also need to check this place when I finally go to Tokyo, and the publication. Thanks for telling us about it! Cafes are these wonderful places where Sartre talked philosophy and J.K.Rowling wrote her first Harry Potter novel and where the coffee is incidental (but usually excellent). LOOK AT THE COCOA (?) MUG AT THE END! Your post makes me miss London! Indeed. Lots of great indies in London now and growing all the time, though, so there are so many options. Ah yes, London. Where else can you pay £3 for an espresso? I’d pay that much purely for aesthetic purposes. love it and am definitely going to pop in for some over priced good looking stuff! Ha! I’ll keep my eyes peeled. Its funny how a magazine would have a spin off and establish a coffee shop. But not for Monocle, they always have a strong branding and do a lot of collaboration with other brands like Porter. 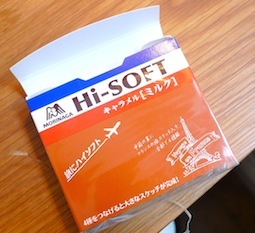 I’m waiting for their hotel, spa and airline in the not too distance future. I don’t doubt but they’re in the pipeline. And apartments too, probably! It sounds like a great indulgence — one I would enjoy engaging in! Very funny… really enjoyed this. 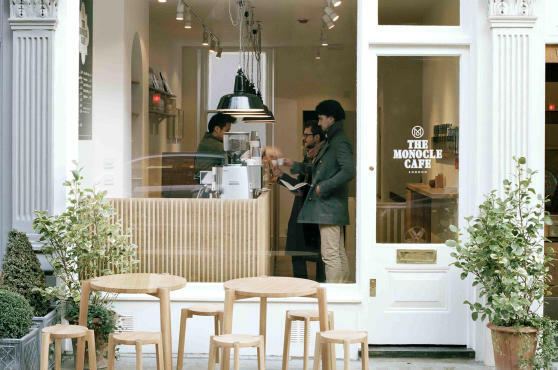 The Monocle Cafe is just too-aptly named for such a “precious” place. Thank you! Cafés where you can’t sit in the windows are infuriating, even worse are the ones where you can only to then discover you can’t see a bloody thing through the badly laminated menus splattered right across the eyeline. Café rage. Ohh what a pretty café! I could stay in there all day! A wonderfully entertaining read – you’re a master of your art! Thank you. Great post. Love your blog. Shall look forward to reading more. Thank you for a most entertaining post; as much as I relish a superb cup of coffee, I fear I lack sufficient crunk to aspire to your level of epicurean delight. I must live vicariously through you and your friend who takes such inspired photos. The design elements are superb! All best! Reblogged this on Deniss Katjko.